A school bus with 20 students on board slid down an icy street after a flash freeze in Sutton, Massachusetts; no one was injured. A Massachusetts town saw two separate crashes involving a school bus and a school van amid icy road conditions on Tuesday, with the school bus crash caught in a dramatic video. Although no one was injured when the full-sized Sutton school bus slid down Peachtree Drive Tuesday morning, two adults and a child were taken to a hospital after the school van they were inside crashed on Dodge Road later that afternoon. The child, whose age was not released, was conscious and alert when first responders arrived, and was taken for evaluation. The conditions of the adults inside the school van are unclear at this time. In the crash on Peachtree Drive, officials said the bus was on the road after picking up students, and due to a flash freeze and slippery conditions, the bus slid back down the street, taking out three mailboxes before bumping into a car. The bus was filled with 29 middle and high school students at the time, according to police. Video of the bus sliding down the road was caught by a resident who was watching from a nearby window. "We just kind of spin, we take out like five mailboxes and a trash can in the process," said student Connor Ruth, who was on the bus. Sutton Superintendent Ted Friend told NBC10 Boston he feels awful about what happened, and that he was under the impression from highway officials that roads had been taken care of before sending school buses to pick up students. He said Sutton highway workers had treated main roads but had not gotten to side roads when the crash happened. "Being out on the edge of town it seems like we’re one of the last places to get the roads sanded and salted and plowed in the winter," said neighbor Terry Maloney. Marlene Cronin said she narrowly avoided being involved in the crash. "The guy whose car went off the road is going like this to the bus," she said, waving her arms. "'Stop, don't come down the hill, don't come down the hill,' but the bus had just started up just enough that it couldn't stop." 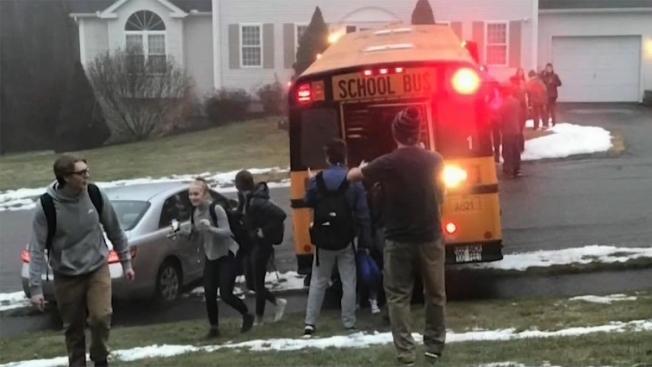 Shane Katz, whose wife Cheryl caught the dramatic video of the bus taking out mailboxes and eventually hitting a car, watched as the scene with the school bus unfolded - while their seventh-grade son waited at the bus stop below. "I heard a crash, and a second crash, and I heard my wife say, 'Oh my God, Oh my God!'" he recalled, "and I'm rushing out to the front here and I just see the school bus just come through, take out the mailbox and just collide into that car." "Thankfully it hit the car because honestly, I was really scared that with the sheer momentum that the bus was picking up, going downhill, I really thought the bus was going to roll over," said Cheryl Katz.